On Holy Thursday, my family prepares for the evening Mass with a Passover reenactment and reflection. The super-rich evening liturgy assumes the Last Supper setting at every point, but we like to underscore that fact with a little drama in the home. These days a lot of people say that they do a Seder meal or that they do a “Christianized Passover” for Holy Thursday. I’m sorry, but those are both absurd things to say. On the one hand, the Seder is not a Passover meal, because the Passover was a sacrificial banquet, and for sacrifices you have to have the Temple. No, the Seder is a Jewish ritual that was invented after the destruction of the Temple and after Christ had ascended and Christianity was already being preached to the world as something different from Judaism. There is no reason a Christian would celebrate a Seder. On the other hand, the “Christianized Passover” is the Mass. Christ himself “Christianized” the Passover, so it’s kind of silly for Christians to pretend to do that for him. 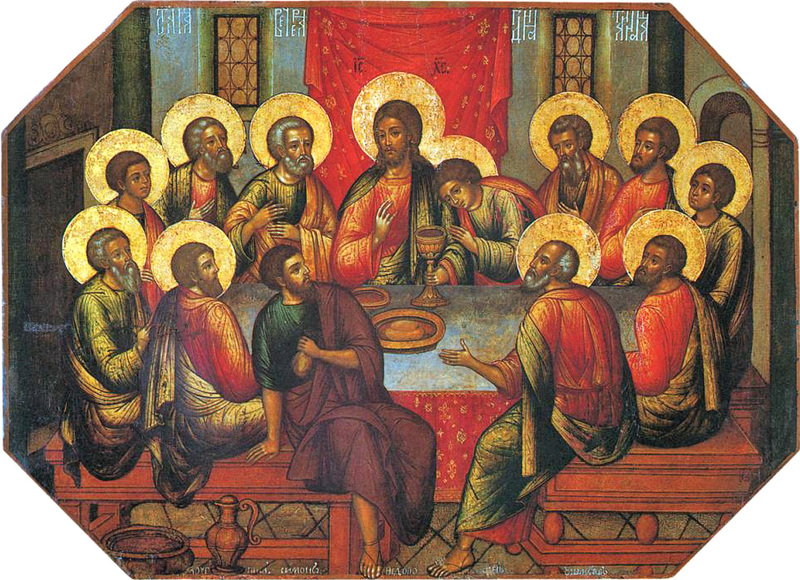 If you want a Christianized Passover, go to the Holy Thursday evening liturgy. What we do at home on Holy Thursday is best called a Passover re-enactment. We try to re-enact what Jesus and his disciples would have done at dinner that night as a way to prepare our minds for what the Church offers us in her liturgy. It’s a devotional prep for the evening. We look forward to it every year! Here’s how we do it. Everyone who participates in the Passover re-enactment gets this slim handout, which explains both the actions and the foods; you can print it on one double-sided sheet. The cook will need this food list, which has some practical notes on how to prepare things. The leader can look at this really detailed overview of the Passover ceremony for background; at the end, I’ve tucked in a bibliography of sources I used in reconstructing the ritual. When I lead people through the devotion for the first time, I often base my comments on this article, which I published some time ago in the Homiletic and Pastoral Review. Do you have any special family traditions for the Triduum? Let me know in the combox. I’d love new ideas for Holy Thursday and Good Friday in particular. My wife is expecting, due within a month or so. When we first discovered the pregnancy, it seemed unreal, just a little colored line on a test strip. It was easy to forget for a moment that anything had happened. But soon my wife couldn’t forget, not even for a moment, and not long after that I felt the same way. Then other people began to ask: is Jacinta expecting? By now, I can sort of play with the little person in there, squishing a little knee to provoke a reaction, and nobody asks anymore whether a baby is on the way. There’s—there’s a person inside my wife! But it all just makes me more eager for the moment of birth. That’s when we meet our new friend. Now he—she?—is real enough, but off in his own world, not yet with us. I always think of my children’s birthdays as the days when we received them, even though in some metaphysical sense we had them for months before that. Birth is when they exist not just in themselves but in a way addressed to us. In its historical origin, Christmas was an epiphany feast, a feast of Christ’s manifestation. In the west the birth was celebrated on December 25 while in the east it was celebrated on January 6 along with other manifestations. In the fourth century, east and west traded feasts and ended up with both December 25 and January 6, and so the first became exclusively a feast of the birth and the second a feast of the other manifestations. If Christmas is the feast of the Incarnation addressed to us, today is the feast of the Incarnation addressed to us only in the person of Mary, a quiet unknown who stands in for all mankind. If Christmas is the feast of light bursting forth on the world, today is the feast of hidden hope. And the feast of hidden hope was the historical origin of the feast of light revealed. The Savior is right there, but the world sees nothing in him to notice. Hope is ready to conquer, but it has no form or beauty that would attract attention. Today’s feast is one of joy, but it highlights an aspect of the otherwise sorrowful season of Lent, the note we should feel in our hearts throughout the day: hidden hope. The role of the “sponsor” was invented in the early Church as a counter-espionage tactic. Because it was illegal to be Christian, there was always a danger that someone would pretend to want Baptism just to get inside the Church and rat everyone out. The sponsor’s job was to vouch for the catechumen’s sincere intention and upright life. Back in the day, babies were only baptized on Easter. That’s how they did it when baptism was for adult converts, so that’s how they did it when only babies were entering the Church. Already in the sixth century, Pope Gregory the Great argued that babies shouldn’t wait so long. At least they didn’t make them wait three years, like catechumens! But this led to another change…. Baptism and confirmation were not clearly distinct sacraments in the early Church. They separated when priests needed to baptize babies on Easter but the bishop could only get to all the parishes once in a long while. Then his anointing and laying on of hands couldn’t happen at the same time as the water dunking. Speaking of which…. Baptism by full immersion came into vogue when only babies were being baptized. In the earliest Church, people would stand in the water while someone poured water over their heads. Babies can’t stand, so it was easier to dunk’em. Eventually, somebody discovered that it was even easier just to pour water on them. By the late middle ages, adults needed special liturgical exceptions to be baptized. Everything had adapted to babies! The rare convert from Islam or Judaism had to be exempted from the rubric saying he should be held in his sponsor’s arms. I found my facts in this book and this one. Do you know any weird Baptism facts? Please share them in the comments. When my family walked into Church today, the crucifix and the statues were covered with purple cloths. Fr. Dave told us that we had entered a time of looking forward to Holy Week, and he called up the candidates for baptism for a brief exorcism and a series of prayers. Where does this special season come from? What does it mean? I am not a historian, but recently I have been reading about the history of the liturgical year. 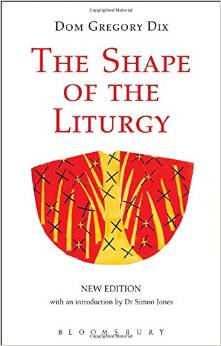 Dom Gregory Dix has an amazing chapter on this history in his book The Shape of the Liturgy, and Dom Gueranger’s The Liturgical Year has an interesting historical introduction to the season. It turns out that the key to understanding Passiontide and Holy Week is baptism. But to see that, we have to look at where the season first came from. Sundays. Christians gathered once every week, on the Lord’s Day, to listen to Scripture and celebrate the Eucharist. This was not yet understood as a Christian day of rest, as per the fourth commandment, but simply as a day to worship and celebrate new life in Christ. After Mass, Christians went to work. Easter and Pentecost. Christians celebrated a feast of the Lord’s resurrection on a Sunday near the time of the Passover, and they celebrated a feast of Pentecost forty days later, around the time of the Jewish feast of the same name. A look backwards in time to what Christ did for us. 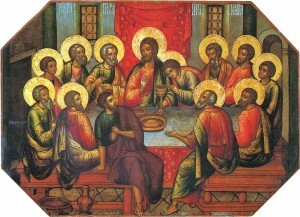 For example, the Eucharist recalls the Last Supper celebrated years ago in the upper room. A highlighting of the grace received in the present moment. For example, the Eucharist signifies (and causes!) our present union with Christ and with each other. A look forward in time to when Christ will come again. For example, the Eucharist gives us a glimpse of the “wedding supper of the Lamb” described in the book of Revelation (Rev 19:7). Our Easter celebration today emphasizes all three, very strongly. But in the earliest days, the emphasis fell on numbers 2 and 3; number 1, the past historical fact of Jesus’ death and resurrection, did not receive the same attention as a past historical fact. For example, there was no Good Friday celebration in which the death of Christ is commemorated apart from his resurrection. Instead, recognizing that our salvation comes from what Christ did, the emphasis fell on how Christians in the present moment were transformed by grace and on how they would enter into God’s kingdom in the future. Fitting right into this emphasis, Easter was the day when people were baptized. The vigil the night before was a time of waiting for the baptismal grace with prayers and readings, and at dawn on Easter Sunday the bishop would baptize the candidates and give them an exhortation, and then the newly baptized would celebrate their first Eucharist with the entire congregation. Scholars often refer to The Apostolic Tradition by Hippolytus for a description of what happened. To get into the spirit of the thing, try this experiment. Imagine you are a gentile convert to Christianity in the waning days of the first century. After a long period of waiting and scrutiny, you have stayed up all night listening to Scripture and praying for transformation in Christ. At dawn you were baptized by the bishop, and now he is giving you an exhortation. OK, now read the First Letter of Peter and imagine that as the bishop’s voice speaking to you. Some people have supposed that 1Peter is a post-baptismal exhortation, but at any rate the themes in that letter are reflected in a lot of post-baptismal Easter homilies from the earliest centuries of the Church. So what about Passiontide? Well, that was a period of preparation for baptism. Catechumens went through two or three years of waiting and scrutiny, during which they were taught little or nothing about the doctrines of the faith or the liturgies of the Church. In the weeks leading up to Easter, the time for their baptism, they finally received doctrinal instruction. In the last two weeks or so before Easter, they fasted and received more frequent instruction along with daily exorcisms, and in the final week leading up to Easter they would at last be given the Apostles’ Creed. They fasted for the two days leading up to Easter, and capped off their preparation with the all-night vigil the night before. That period of more intense preparation for baptism was the seed of our Passiontide, and in fact the seed of the entire season of Lent. Eventually the entire congregation not only celebrated their baptismal transformation on Easter with the newly baptized but also prepared for that day along with the candidates for baptism. The fast was extended back, and everyone was invited to attend the catecheses. Now that the liturgical year has more historical emphasis, we have readings that look to what happened, historically, in the final weeks before Christ died. But the key to understanding much about the season remains that it originated as a season of preparation for baptism–for re-birth in Christ. What connections have you seen between Holy Week and baptism? Let me know in the comments! The commemoration of Saint Epaphroditus, whom Saint Paul the Apostle calls a brother, a fellow worker, and a fellow soldier. The more I read about the fourth century–that’s the 300’s, for all of you who are like me and don’t absorb history quickly–the more I see it as a kind of birth period for the Church. Of course, Christ founded the Church from the cross and revealed her at Pentecost, but as soon as the Roman Empire figured out that Christians were not Jews then it was illegal to be Christian. Even though the Church was by her nature a public and missionary thing, it’s hard to be all that public or all that missionary when anyone around you might rat you out to the government. Imagine you have a foam model of a cathedral. Then you squish it down and mash it and squash it until you can fit it into a tiny cube-shaped box. The foam cathedral in the box is like the Church in the ages of persecution: it’s all in there, but it’s compressed, in some ways beyond recognition. When you take the foam cathedral out of the box, you see the Church over the course of the fourth century: slowly, she spreads out her parts, unfolds herself, assumes her natural size and shape. It was all in there, but in a way it is “being a cathedral” for the first time. Of course, it’s wonderful to find out just how much was in that little box during the ages of persecution: the doctrines already in place, like purgatory and the authority of bishops and the efficacy of sacraments; the practices already in place, like the Mass with its main parts already in force as they stand today. But I have come to put a special value also on what seems to appear during the 300’s. What did the Church do the very moment she was taken from the box? That also tells us something very important. The commemoration of Saint Archippus, the blessed Apostle Paul’s fellow soldier, whom St. Paul himself remembers in his letter to Philemon. The solemnity of Saint Joseph, spouse of the most blessed Virgin Mary, who, being a just man and arisen from the stock of David, was a foster father to Jesus Christ the Son of God, who willed to be called the son of Joseph and was subject to him as a son to his father. The Church venerates with a special honor the patron whom the Lord set over his own family. Today we celebrate the feast of St. Cyril of Jerusalem. I have been familiar with Cyril for many years through his Catecheses, written about 347 or 348 AD, just a couple of years before he became the bishop of Jerusalem. But only recently have I learned about the pilgrimage of Etheria to Jerusalem in about the year 385 AD: she wrote an account of her journey, including detailed descriptions of the liturgies in Jerusalem. When we look at Cyril’s writings from just before his episcopal ministry and Etheria’s account from several decades later, we can see what Cyril accomplished during his years as bishop. His list of achievements is phenomenal. But to understand Cyril’s importance, you have to know a bit about Jerusalem’s place in the Church at the time. When Constantine legalized Christianity in 312, the Church began transforming herself from a private and secretive group into a public institution. The Church is public by her very nature, but the circumstances of Roman persecution had kept her, so to speak, crammed into a little box; the lid removed, she began to unfold her true dimensions. In this time of rapid change her liturgies, which had been secret and held in private homes and exclusive, became large, public, and impressive. At this crucial moment for the development of the liturgy, attention turned to Jerusalem. The importance of Jerusalem for the new Christian world can be seen in the fact that Constantine’s own mother went on pilgrimage to the sacred sites in 325 AD. Under constant persecutions, Christians had focused on how the liturgy connected them with what is beyond this world, with heaven; the persecutions safely in the past, Christians could begin to think about how the liturgy also connected them with the world around them. And nothing in this world seemed so closely connected to the liturgical mysteries than the sacred sites of Jerusalem. Etheria’s pilgrimage was part of a wave of visitors to Jerusalem who came to worship at the sacred places and went home to report how worship was conducted in Jerusalem—Jerusalem, the original location where Christ offered his sacrifice! The adoption of the divine office as a public function of the Church rather than a private devotion of monks. Special readings at Mass and in the office for saints’ feasts and for different liturgical seasons (the proper of saints and the proper of seasons). The liturgical veneration of saints from across the whole church instead of the veneration of local martyrs only. The use of liturgical vestments, incense at the gospel, and other familiar elements in the Mass. The liturgies of Passion Sunday, Palm Sunday, Holy Thursday, and Good Friday, as well as the practice of not having Mass on Holy Saturday. The series of readings we all know at the Easter Vigil. So if you read the breviary today, thank Cyril. If you are looking forward to the beautiful Holy Week liturgies, thank Cyril. 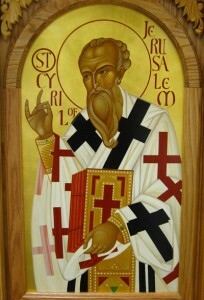 If you celebrate Cyril’s feast today, thank Cyril—he put us on track toward celebrating more than just local martyrs. And if you are awed by how much this one good pastor of the fourth century did for the Church, thank God!